The figure on the right is known as the skeletal formula. Observe that the vertices represent the carbon atoms and that all the hydrogen atoms bonded to the carbon atoms are not shown. Note that the chlorine and oxygen atoms must be displayed. Also, the hydrogen atom attached to the oxygen atom must be drawn, since it is not bonded to a carbon atom. Since every neutral carbon atom must have four bonds, there must be a hydrogen atom attached to the carbon atom that is bonded to two chlorine atoms. 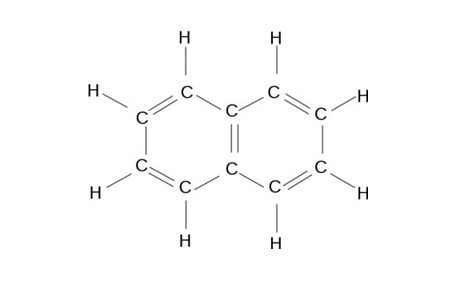 How many carbon atoms and hydrogen atoms does the following molecule have? (3) wedge-shaped lines to represent bonds oriented facing the viewer. 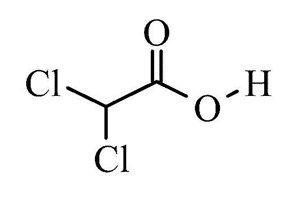 It is a way of representing an organic compound from a rather oblique angle to study its conformations. It is a very efficient way of studying conformations of a compound along with its optical character as it is easily convertible into Fischer projection and Newman projections. In this representation, we observe two carbon atoms bonded with each other along with the groups attached to them from an edge view unlike that in Newman projection in which we observe it from front view. This here is a saw-horse projection of \(n\)-Butane: Notice how the perspective is different from that of a Newman projection. Just as in Newman projection, the saw-horse projection can be eclipsed, staggered, and gauche.